U.S. Marshall Rourke Kincaid is sure that there is more to the cols case of the unsolved murders that happened in various towns in the month of October every year till two years ago. Sure about his instincts but not supported by his office, he goes rogue and undercover and is led to the remote, isolated and wild town in Beartooth, Montana. A fragile looking, beautiful waitress, Callie Westfield who works in an unassuming cafe in this small and insignificant town is his suspect. While Rourke is left surprised and unsure of Callie, the gory crimes begin again. As if this is not enough, there is something suspicious about Callie. She never remains in one place for long, has only held odd jobs and is seemingly cautious in her attempts to remain unattached. Is Callie really connected to the grotesque serial murders? Who is she really and why is there no record of her childhood anywhere? 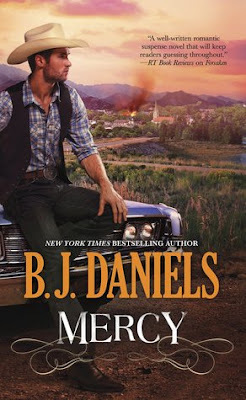 Mercy is the fifth book in the Beartooth Montana series and another awesome read from the author. I haven't read the previous books in the series so when I got this book to review I was a bit nervous. I was scared of feeling confused and disconnected with the series since I had no idea about the base story but when I started the book, it soon became clear that this is a standalone story and the reader need not be concerned about not having read the previous books! Ever since I was introduced to B.J. Daniels two years back, she has made her place in my list of favorite authors. All her books are unique and distinctly different from each other. Mercy also fits perfectly in this category. The plot is expertly conceived and executed. The author admirably uses a feel of the supernatural in this book. There is mystery, suspense, the thrill of a chase, a dark and dooming sense of impending danger, hidden secrets of the past and the excitement of the suggestive supernatural which excites the readers with questions like Can people really see into the future? Can they read other people's minds? Can we sense future danger? Are some places really evil Or are the people who live in it make them so? I loved the cover and the blurb which instantly attracted me. The characterization is also expertly done and people in the book have many facets to their personalities. These are complex people with their own ideologies and beliefs which are sometimes twisted and take a dark nature of their own. I felt goosebumps break out while reading the book and was so intrigued by the idea of ghosts, future visions, reading people's minds, the possibility of the supernatural and a serial killer who is elusive and just a figure with no identity, that the story felt all the more alluring. I was sucked in the book and felt each scare and mysterious shock as well the ominous shift in the atmosphere signalling the impending danger. There are so many layers to the mystery and so much going on that the story kept me glued to my seat and while I was getting pretty scared and jumping at even the faintest sound in my house while reading the book, still I just could not keep the book down! The chemistry between Rourke and Callie is sweet and I loved the scenes between them. The other characters like Laura, Rourke's ex-partner and her dysfunctional family comprising of her sister and mother were enough to give me the creeps. "Yikes! one never knows anyone truly" was what I kept thinking while reading the book. BJ throws well planned twists and turns and manages to keep the suspense going till the very end. Although I deduced the solution before the end but it didn't in anyway affect my interest in the book. Kudos to the author for writing such a memorable story. This is a book you must read. I give Mercy 4.5 out of 5 and recommend it to everyone. I am definitely going to read the other books in the series. I received the book from NetGalley and the publishers, Harlequin HQN and I am very thankful to them. The above review is my honest and unbiased opinion and in no way influenced.